The xcelerator Pro skate plus bindings are Rottefella top-of-the line cross-country skate bindings with the added plus advantage of a 10mm Ramp for an improved neutral stance position and improved biomechanics with each stride. The Pro skate plus is designed to provide exceptional power transfer and optimize glide for skaters from world cup on down. With a full width of 58.5mm underfoot the xcelerator Pro skate plus bindings offer an exceptionally stable platform and provide optimal power transfer with every stride. What sets the xcelerator Pro series apart from the xcelerator 2.0 series is Rottefella quick lock system which allows the user to quickly move bindings forward or back on the nis plate without the use of a tool. Slide the bindings forward for increased control or adjust them backwards to gain improved glide. 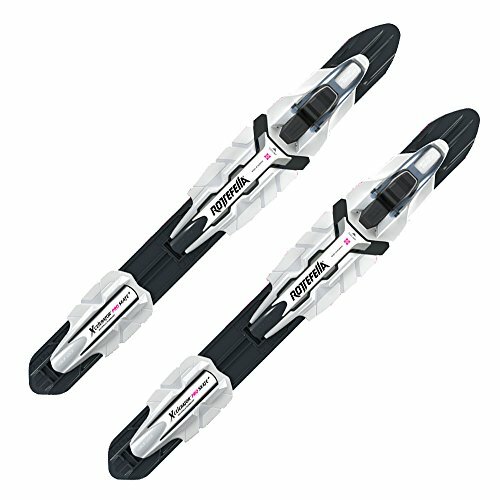 The underfoot quick-lock wings are locked in place while skiing and readily accessible for quick binding position changes once off the boots. Designed and built by Rottefella in Norway, the xcelerator Pro skate plus bindings offer the most durable and trouble free boot to binding connection on the market and are compatible with nnn, turnamic, and prolink boot soles. Requires Rottefella nis binding plate on skis for mounting. Fit Adult boot sizes - EU 36-52, weight: 210 gr. If you have any questions about this product by Rottefella, contact us by completing and submitting the form below. If you are looking for a specif part number, please include it with your message.